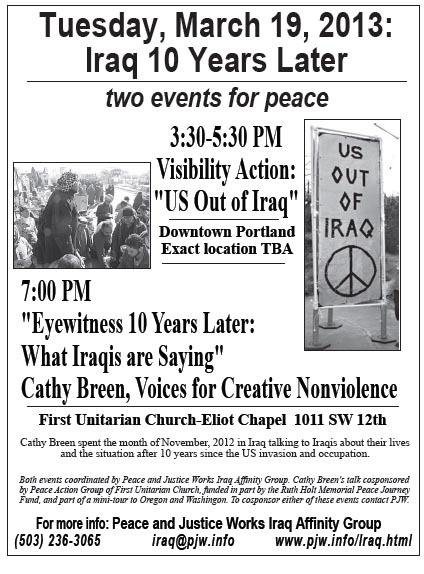 3:30-5:30 PM: Visibility Action: "US Out of Iraq"
Tuesday, March 19 marks exactly 10 years since the US invasion of Iraq, an ignoble anniversary to be marked by two events for peace in Portland. The first is a visibility action, "US Out of Iraq!" to be held at the corner of SW Broadway and Morrison from 3:30 to 5:30 PM. The second will feature Cathy Breen of Voices for Creative Nonviolence who spent six weeks in Iraq in October and November 2012, speaking on "Eyewitness 10 Years Later: What Iraqis Are Saying." Ms. Breen will speak at 7 PM on the 19th in the Eliot Chapel at First Unitarian Church, 1011 SW 12th in downtown Portland. Cathy Breen lives and works at one of the Catholic Worker houses of hospitality in NY City. Her solo visit to Iraq was her first in nine years and brought stories of the conditions of the country after being invaded, occupied and wracked with violence. She will present photos and stories to bring the humanity of ordinary Iraqis to the audience. Breen went to Iraq in Fall of 2002 with Voices in the Wilderness as part of the Iraq Peace Team, staying for over five months including through the "Shock and Awe" bombing campaign led by the U.S. She returned to Iraq in late 2003 for another three month visit. Since 2006, she has spent time in Jordan and Syria witnessing and advocating for Iraqi refugees of the aftermath of the US invasion. Both events are free and open to the public, and coordinated by Peace and Justice Works (PJW) Iraq Affinity Group. The Visibility Action is cosponsored by Veterans for Peace Chapter 72 and Women's International League for Peace and Freedom-Portland. Ms. Breen's visit is funded in part by PJW's Ruth Holt Memorial Peace Journey Fund, and is cosponsored by the First Unitarian Church Peace Action Group, American Friends Service Committee and Women's International League for Peace and Freedom-Portland. Ms. Breen will also be speaking in Eugene, OR on Wednesday, March 20, and at various sites in Seattle from Thursday, March 21 through Saturday, March 23. For other events around the 10 year anniversary of the 2003 US invasion visit the PJW website at http://www.pjw.info. For more information or for your organization to get involved contact PJW at 503-236-3065 or iraq @ pjw.info.